According to Know Your Meme, a new emoticon is sweeping message boards all across the world. And it’s not happy. The emoticon is known as the “look of disapproval,” and it’s easy to see why. Those bushy eyebrows. The flat, expressionless mouth. Those eyeballs staring right into your soul. But the face didn’t draw my attention for its utility — there are plenty of expressive emoticons out there. I noticed it because the character ಠ * is drawn directly from my first language, Kannada. The character represents the letter “ṭha,” the retroflex aspirated unvoiced consonant /ʈʰa/, for example in the word ಠಕ್ಕ ṭhakka, thief. It is formed by curling the tongue back (a retroflex position) and striking the palate while releasing a small puff of air. In my previous post about Indian abugidas, I explained how most Indian alphabets are organized in a systematic chart of voicing, aspiration, and tongue position. The letter ṭha appears after the unaspirated voiceless retroflex plosive ṭa (/ʈa/) and before the unaspirated and aspirated voiced retroflex plosives ḍa (/ɖa/) and ḍha (/ɖʰa/). The character’s form is developmentally related to the Devanagari (Hindi, Marathi, Nepali, etc.) character ठ *, which represents the same sound /ʈʰa/. Both the Kannada and Devanagari character evolved from the Brahmi character O. The Brahmi character may, in turn, have evolved (although this is disputed) from the Phoenician character letter teth (to the right), which also gave rise to the Greek letter θ, theta. In Ancient Greek, θ represented the aspirated voiceless dental plosive /t̪ʰ/ but Modern Greek uses a voiceless dental fricative /θ/ (English “thin”). Some Indian linguists believe that Phoenician teth also gave rise to the characters for the aspirated voiceless dental plosive (identical to the Ancient Greek pronunciation of theta) characters in Kannada (ಥ *) and Hindi (थ *) as well. Anyway, it’s pretty amusing to what lengths people have taken the ಠ_ಠ meme. 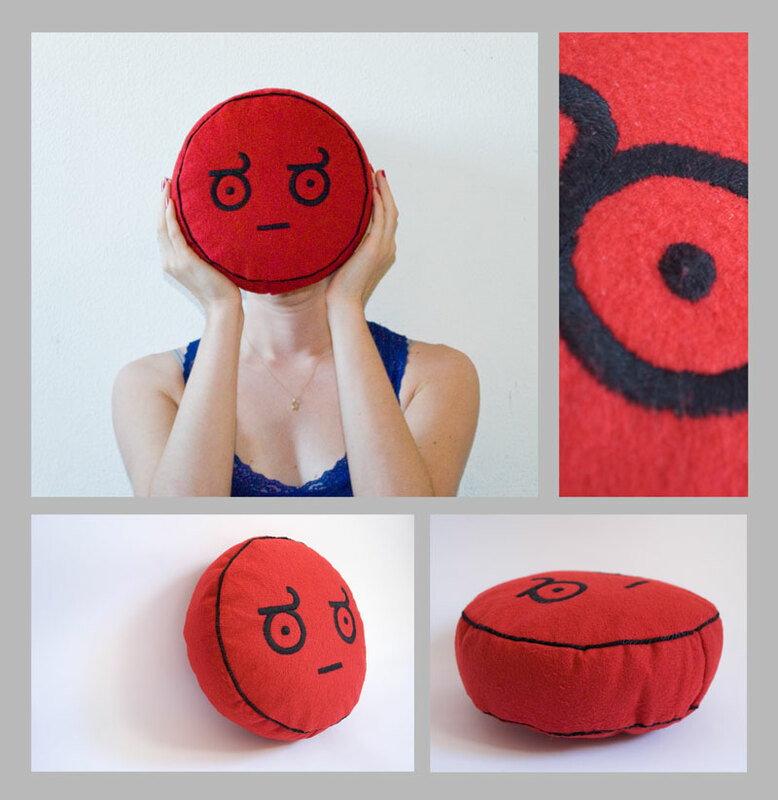 One woman even created a pillow so she could express her disapproval all the time. While it bothers me that few people know where the character comes from (a message board I saw suggested “Indian,” “Malaysian or something equally ethnic,” and Telugu before someone pointed out that it was from Kannada), it’s probably all harmless fun. Wiktionary has an entry on the emoticon and has a proper etymology. There’s a page dedicated to it on Facebook. Someone also designed a website where the eyes follow your mouse around. This is all bizarre to me. But I guess the letter does look like an eye. And it’s not like other languages’ characters are immune to becoming emoticons (a current favorite: (ノ° 益 °)ノ彡┻━┻, which uses the Chinese characters yì and shān). *- Some people, mostly Mac users, don’t have Indian language functionality. Just in case, here is what each of the characters looks like. When learning to read Gurmukhi, I was delighted to see that ” ठ ” is exactly the same in that script – why the Gurus decided they needed a new script for Panjabi when Devanagari does just fine is beyond me, but at least that one letter made the cut. Gurmukhi was not an ad hoc invention, nor is it derived from Nagari. The scripts have a common ancestor in Brahmi, to be sure, but represent centuries of independent evolution. I know it’s not derived from devanagari, although some of its characters are taken from it and others were consciously influenced by it. Although the script as a whole is a development of that used for a language spoken prior to “modern” Panjabi, the gurus DID codify, for want of of a better word, the current Gurmukhi script, and that at a time when there was already a perfectly serviceable alternative, one that Hindi, Nepali, Marathi et al. have all found works just fine. At least from the point of view of this lay learner, who loves the simplicity and clarity of devanagari. (sad man kneeling on ground). Thanks for this – I went and immediately put kannada keyboard into my list – it’s quite easy on macs really. there’s a qwerty and non-qwerty version right in system preferences!